Do the mighty judges have the layman’s wisdom? As Union health minister Anbumani Ramadoss‘s diktat for a nationwide ban on smoking in public spaces, including private offices, from October 2 awaits judicial scrutiny, an opinion poll shows the Supreme Court just how to stub out tobacco major ITC’s case. 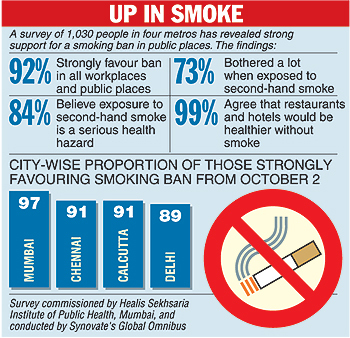 Also read: CHURUMURI POLL: Will the smoking ban work? This entry was posted in Issues and Ideas, People and tagged Anbumani Ramadoss, Ban, Churumuri, Sans Serif, Smoking. Bookmark the permalink. Will it work or not? That should not be the question. It has to work. For the sake a few people majority should not suffer. Whether you like Anbumani or not , it is immaterial. Ban smoking in public places absolutely. Well done Anbumani Ramadoss ravare! It has been a bold step. One good thing is you are not from the BJP ( BJP biters would have eaten you up), and unfortunately you are from TN ( Will we implement it in karnataka)! This is just a gimmick. If they have the political will, why not ban cultivation of Tobacco in the country ? I hope the judges keep the “layman’s wisdom” aside. Those who don’t want to smoke should start their own “non-smoking” restaurants and bars. Who the hell are they to decide what I do in my office? The smoking ban is state paternalism at its astounding worst. The Indian “layman” is wholly responsible for the dictatorial nature of successive governments. What next? Compulsory physical training for fat uncles and aunties to reduce their waistlines, help reduce their “sugar” and save them from heart attacks? What about banning cars and buses and forcing people to take to bicycles? That will save treatment costs on asthma and bronchitis and a multitude of other diseases. Next in line – banning fast food. This is nothing but another attempt by the state at micromanaging the lives of the citizens. The sooner this government goes the better; Ramadoss has been a pain in the a*** since he assumed office. We need a ban on all future bans. I am a smoker myself and completely agree that a non smoker should not be made victim of a smokers habit. But what are the people above who have complimented the decission thinking. A bar and a restaurant is a place which can be accessed out of choice. There are equal number of places which allow and do not allow smoking. Why is a non smoker who is wary of passive smoking entering a place which allows smoking when he has a choice of not being there in the first place? Can someone answer this for me? As far as public places like roads, bus stops, railway stations etc. are concerned, where non smokers have to invariably access the place, banning smoking seems a right idea. But Mr. Ramdoss must not be the one to dictate whether a restaurant which is privately run should allow smoking or not. Consumers have the right to choose and in a free market economy, if the restauranteer goes into loss owing to allowing of smoking, he is bound to change his strategies. I firmly beleive that areas which are accessed by smokers and non smokers alike and where you donot have an alternative, public places falling under such category needs to implement the ban. It’s puerile and imbecile at the same time from Mr. Ramdoss to act in such a way and I can only see a decission of haste and complete absence of reasoning and understanding of the principles of a free state here. Mr. Ramdoss would rather do well to counter the tobacco industries in an upright manner by advertising and educating the mass about the evils of tobacco rather than using such “iron fist in a velvet glove” knd of strategies. And also let him not forget the basic problem plaguing the country like primary health care, invasive politics in rural health centres, adulterated/duplicate medicines and a host of other issues. Mr. Ramdoss is just another “lion in the garb of the lamb” politician and let him not forget that we are mature people and we are in a position to make our choices and that the STATE should be involved in educating the people so that they can make their own choices rather than the STATE making the choices for the people. This had to happen long time back. With ITC’s non-tobacco business heading nowhere, the company is taking a chance by approaching the court. It’s time the Govt puts in place some order so that public places are not taken for granted. Whether this is a gimmick or not, surely it takes some will to bring this into forces, especially in India where there is not much importance attached to public opinion. Now who will fix all the autos/buses/trucks that spew toxics? Those vehicles which almost tear apart our ear drums? They too are health hazards. What we need urgently in this country is ban on peeing and shitting in the public and desecrating the streets…both by men and dogs….hope somebody pays attention to this. Health Insurance companies in India has gotten bigger and powerful in last few years, all this is a result of this powerful lobby. Have you wondered how any research report linking smoking to anything from hair loss to any ailment is publicized. While there is no denying smoking is harmful to health there is no denying Anbumani Ramdoss is doing what this Lobby is asking him do. It’s a very bold move by Ramdoss. 60 years of rule has not got us anywhere. Corporate lobby is at work. This will spread public awareness. In a capitalist society there are going to be pulls and pressures, but we cant yield to any of these. Let us thank Anbu Mani(c – Mullah) Ram-Dose for saving the health of nation, by bringing a legislation (Fatwa?). The beauty of the fatwa is our poor poor government need not a spend a single paise for bringing our ever disease ridden populations to health, more over the fatwa will bring revenues (@ Rs 200 for every swig). What a genius! wahwa! Ada baras! But the problem is our secular democratic republic is slowly changing into a shariath kind of kingdom, with the influence of our brother and neighbor. So expect more bans from now on, because to prove their fatwaing prowess is better than UPA, NDA may issue some more fatwas if they come to power next. If we people support such fatwas like some dumb a** writers of letters to the editors, we will be in for more fatwas, like no meat on saturday and friday, no liquor on any day! if caught found drinking 50 lashes in public, etc. Sounds familiar isn’t it? God bless our innocent citizens! Shahrukh Khan,Amitabh Bacchan,Buddha Deb Battacharya and Ajay Devgan who were for pro smoking cause will have to watch out. All kind of excuses such as creative benefit were being hurled as excuse to smoke in public and on screen. Now Ramodass has done what no minister ever had the guts to carry. He needs to be given Bharat Ratna. He is indeed the great son of India. He has saving Billions of dollars of health care costs and death of innocent citizens. Some of the comments above indicating their approval of Mr. Ramdoss’s autocracy is only a reflection of our larger public which is mostly cranially degenerating. Can someone use their brains to reason out things rather than blindly approving or going off on tangents to the topic. @ Tarlemaga: “Billions of dollars of health care costs”. I must say this is akin to the “compulsory helmet rule”. A government that cannot provide for basic health amenities and which in any case is not going to provide any noteworthy treatment to the injured forces people to wear helmets. All it had to do was to say that it wont provide for free of cost whatever little treatment it was providing for accident prone victims who weren’t following the guidelines of the govt. to wear helmets. Having such autocratic policies doesn’t reflect well upon a socialist democratic republic. And as far as your opinion about Bharath Ratna is concerned, I wont be surprised if it materialises because it’s blind rhetoric like yours which gets more prominence and coverage thereby misleading a vast majority to think that itself is the popular opinion. How about making marijuana legal in India? It is definitely less harmful than the cigarette and nobody would lose. Also most of the Hindu fanatics do love him for an altogether different reason. If you ask me, we should ban the cultivation of Tobacco in India. That will make you folks to settle down in United Capitalist State of America. Anything sells in that country. All you require is marketing capability and the endorsement by some mad men. Finally India is becoming Independent even during the Capitalist age. Mohammed Bin Tuglak can place orders. But, he CANNOT implement all these stuff right now. – They waste public money by paying increased prices while buying medicines. – No functioning of G.H in villages where most of our population live. Waste all the money they get for educating people on AIDS and personal hygiene. – Doctors are doing business (Now a days even hospitals are registered in the name of Doctors. There are no ethical values. Count how many people die out of carelessness of Anbumani’s department. The focus should be to educate the young generation on health. I do not know what you intend to convey by your reply but all I can make of it is that you seem to take a very shallow view of things and if I were to suggest something purely based on your reply, you haven’t exercised your faculty of thought for quite some time now and you seem to think that a public forum is like public urinals where, mostly frustrated men display their graffiti. Nevertheless if I may insist you to read my first comment on this issue, you might realise that it’s the nature of the ban rather than the ban itself that I contest. Perhaps you do not understand what is freedom. I do not mean that freedom should allow you to encroach upon others right of a clean atmosphere but at the same time it’s unbecoming of a STATE to enforce ban in private areas. (And yes, restaurants are private areas because a private party is investing and you have the choice to not visit that place. You must understand that thay are doing business and not public service.) For a mind like yours which is conditioned to conclusivetly point out good and bad without a second thought, banning tobacco seems a feasible idea. But if you were to stretch your cranial capabilities a bit more you would understand that FREEDOM is the opportunity to make your own choices (read, DO NOT SMOKE) and to not let STATE make choices for you. And as far as your blind rhetoric on patriotism, which manifests itself in looking down upon other countries is concerned, I can only pity your uncivilised approach. To rest your emotions upon a geographical boundary, speaks of a narrow minded ugliness, which at the most can be condoled upon. You are wasting you time Prashanth. The ‘average Indian’ publicly worships Gandhi while privately prostrating before the likes of Hitler and Stalin. Since physical violence is not everybody’s cup of tea, he compromises by resorting to mental violence, for the moment. You just have to see how ‘happy’ the anti-smoking crusaders are now that restrictions have been placed on smoking – the happiness being the kind that sociopaths derive by cutting off the limbs of a kitten one by one and watching it struggle, bleed and die. Always, at every moment, there will be the thrill of victory, the sensation of trampling on an enemy who is helpless. If you want a picture of the future, imagine a boot stamping on a human face—for ever. Be prepared for more intrusive laws. Soon people will be required to apply for permits just so that they can indulge in the sexual act – the bedroom police, we can call it. How can we allow those who cannot be trusted to see and read what they want or make choices about their health to bring a new life into the world without government permission! Dont give me the Rigveda gyaan to smoke.. Unfortunately Govt has to regulate your health. It is like you deciding on suicide. Smoking is akin to that. Freedom does not mean that there will not be any form of regulations. In case you require a fully liberalised society then settle down in Netherland. If you didn’t understand what the quote from Rigveda meant, here is the translation for you. “Let noble thoughts come to us from all sides”. It was just acceptance of your right to have a view and not necessarily agreement with you. Anyway I just hope nature shall endow you with ability to make a more honorable form of communication in the future and may you some day realize that freedom is and should always be ABSOLUTE. This is the wisdom of 5000 years of our civilization which was based on inquiry and argument, which is unfortunately contorted owing to our lack of inquiring mind. Let’s just hope that better sense prevails.